For the past several weeks, I along with other good friends (Mark Dean, Charlie Fowler, Daiva Chesonis, Chris Boskoff) have been exploring more of the Telluride Conglomerate rock just west of the Pipeline Wall. So far we have been finding many high-quality routes. This topo includes some of our new routes established thus far. Access to these routes is not yet secured, in the legal sense that is. The Idarado Mining Company currently maintains some 361 mining claims, representing an estimated 7,435 acres of land holdings in the San Juan region. Much of this land will revert back to public lands in the near future. Until the land transfer is complete, however, it is best to approach this area via the standard Pipeline Wall access—though this will be a bit of an approach/bush-whack, the quality of the routes will make it worth the trouble. The upper right photo is DJ on the FA of Zen Lemonade. 1) Trans Lunar Injection Burn, 5.11-, 3 Pitches. FA: DJ, MD, (DJ, CF, MD on Pitch 1; DJ & MD on Pitches 2 & 3). Pitch 1, 5.10-, (full 60m pitch) heads up a face to the right of the large broken-up (chossy) corner. Once you hit the steep head wall (just over 1/2 way up), head left into the crack for a few moves (you will use the crack for protection from here up. 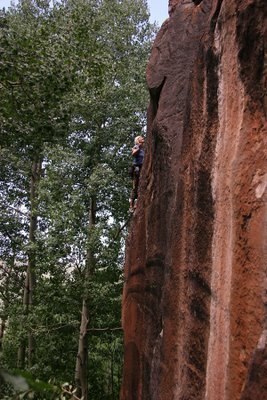 Traverse right across the ledge (second from the highest ledge) to the anchor. Gear 12 QD’s and two anchor rigs. Protection: .5 to #4 Camalots. Pitch 2, 5.11-,heads up the buttress 105’ to the next anchor (crux pitch). You can leave you natural gear from here on out and retrieve it on the way down—just draws and anchors. Pitch 3, 5.9+, 100’. Continue up the steep headwall for a few moves to the slab above. The grade backs off and the bolts are further part (PG 13, say). There is a small 4th pitch that leads to the large ledge above (I am recommending that climbers rap rather than walk off this route—mostly to avoid dropping rocks below-low 5th class down climbing/4th class should be expected). Rap. 2) Thunder Road, 5.9+, 1 Pitch (for now). This is a fun warm-up. You need 13 draws and something for the anchor. Fun route! Rap. FA: DJ, MD, CF, DC 6-06. 3) Zen Lemonade, 5.11-, 3 Pitches. 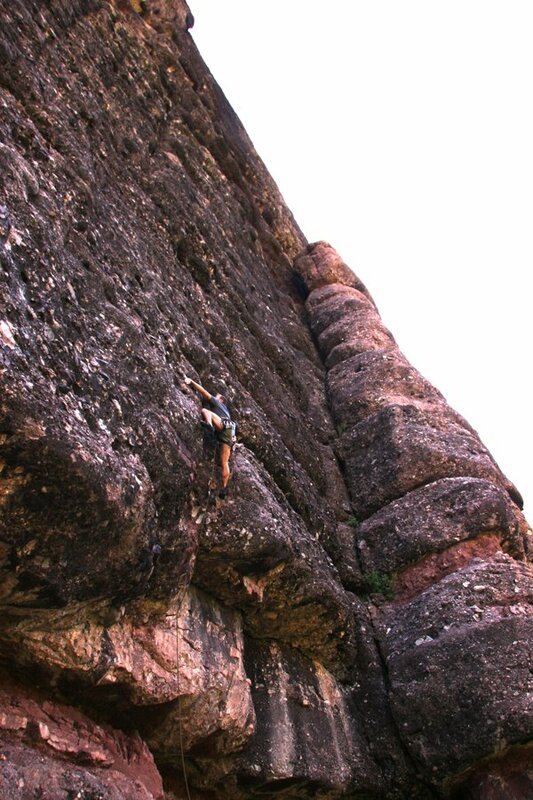 Pitch 1, begin by climbing a roof to a steep face—100’. Pitch 2, head up and slightly left into the base of the large corner (the crux is climbing into the corner from below) 100’. Pitch 3, continues up the corner for a few body lengths then heads out and right onto the face (bolts) 100’. Gear: thin to wide hands, 12 draws, and two anchor rigs. Rap. FA: DJ, MD, CF 6-06. 4) Hokey Pokey, 5.9+ R, 1 Pitch (for now). Climb the left facing corner for 100’. Gear: lots of hands to OW (bring the big stuff). There are no bolts on this route but there may end up being a few in the near future as the OW is almost chimney like in a few places. Routes 5—8 are east (up hill…not in photo). 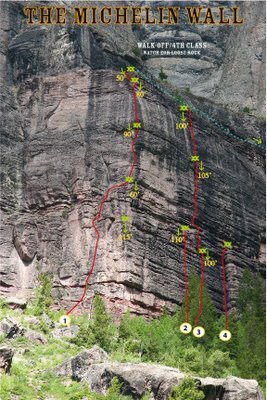 Charlie and Chris established a 4 pitch arête route that goes at 5.11…and they did a few single pitches to the right (east) of that. More on these routes soon. There are several more routes to do in this area. At the moment I am waiting for more bolts from Petzl. There is also a lot of info to report from a “top-secret” area south of Rico (here is a photo Julie Hodson on a “fresh” route). 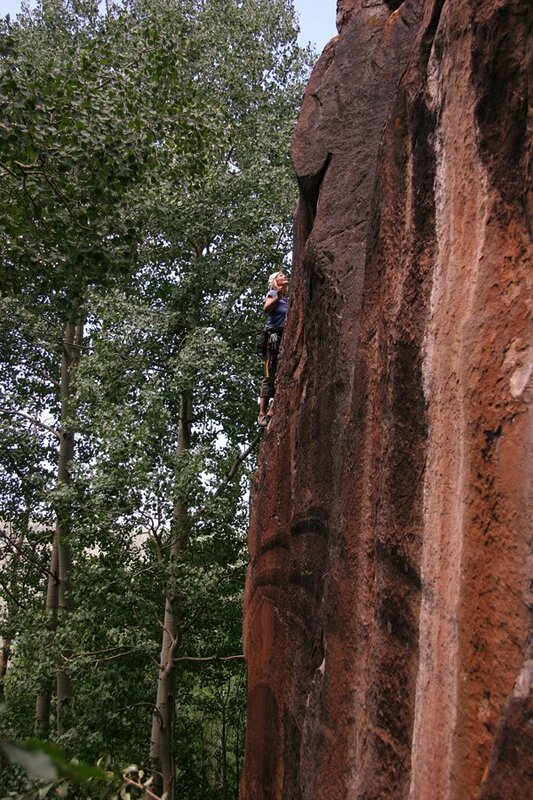 More on this area later, but many, many new routes at the Carly Crag.